One of the biggest challenges for health systems is to be aggressive and stay ahead of the curve while also maintaining a healthy bottom line. And although there is no magic bullet to achieving that balance, one key ingredient, according to Tom Pacek, is having a board that’s committed to excellence and is willing to take risks. In this interview, he talks about his top priorities, including migrating ambulatory onto a single EHR platform, sustaining Inspira’s Medicare ACO, and creating an infrastructure to ensure redundancy as the organization continues to grow. Pacek also discusses the blurring of lines when it comes to data ownership, how he deals with physician trust issues, his team’s strong focus on care coordination, and his strategy for keeping the staff engaged. We tell our employees, when you’re home, you’re home. Try to stay home. We have on-call people. They’ll take care of the stuff after hours and all weekends. Don’t worry about it. This is the most interesting time in my 35 years in healthcare IT. It is absolutely very dynamic. We don’t even know what the future holds for us; we just know it’s going to be different than it is today. I wouldn’t say we were bleeding edge, but we like to be on the cutting edge of things as much as possible. As long as we stay aggressive and we stay mindful of our expenses and do a good job there, I see this organization just continuing to move forward at a rapid pace. IT people are a little bit different than the rest of the executive team in that we like to be collaborative with our competitors. We don’t necessarily see it as a competition, because we share common problems and we’re all trying to help each other out. Gamble: Another big issue is the ability to recruit and retain top people — you have so much competition everywhere. I wanted to talk about your approach. Pacek: You know, that’s a good one. We were one of the top hospitals last year as far as employee satisfaction goes, and it really comes from a couple things. One, we’re doing a lot of exciting things here. If you’re looking to get experience with a bunch of different technologies and a bunch of different roles, we’re certainly a place where you want to come. We promote from within, so that gives the existing employee base a nice satisfaction. We’ve created levels over time so that when you have a systems analyst, you’ve got a systems analyst that’s capable of X. You have the next level systems analyst which adds some new responsibilities to that, as well as some financial benefits. So we have three levels of many of our most popular positions — business analyst, clinical analyst, informatics positions, even technicians. We have different levels of technicians. It’s not always possible to move from one position to a completely different position; there might not be something open. But for people have been in their role and they’re happy, we want to keep them progressing in their careers — if they want that. Some people are really happy doing what they’re doing, and that’s fine. We need those people too; those good employees that like to do their jobs. Work-life balance is huge. That’s a tough one to get around because it’s personal to each individual employee. They all take that a little bit differently, but we really preach work life balance here. With the major projects we’ve been doing, you would think these people probably work a ton of hours. They are; they work a lot of hours. They work really hard. The way we relieve that is we build consulting dollars into the budget process to help alleviate the staff, so they’re not looking at it as ‘somebody’s trying to take my job from me,’ but, ‘hey, they respect the fact that I need some support.’ We bring in some consultants to help with the projects so it’s not over burdensome on the employees in the staff. And we get creative. I have some great directors here that really think out of the box. We have some colleges and universities locally here in the medical field, so we use medical students. On our last project when we brought Woodbury up on Soarian, we actually brought some medical students in. We gave them some money in the summer time between semesters when they typically want to be earning anything, and got them a part on our project, and they’re learning. It was satisfactory to them. They’re learning something in the healthcare field, and we’re getting inexpensive, affordable labor, and we’re getting help for our staff. Those types of things really help with the employee morale around here. We also do internships. We do paid internships over the summer time. We’ve had very successful interns where we’ve actually hired four of them over the last three years into full-time positions here, and they’ve become very good quality employees. Gamble: A lot of interesting stuff there. You brought up work life balance and that’s interesting to me because it seems like it has to come from the top down. You talked about encouraging people to do that, but if they see that the people that they work for are always in the office, it’s almost one of those things where they need that permission, or they need to see that others are doing that too. Did you find that to be the case? Pacek: We do. I do it a lot. I’m very much an early riser. I’m in here really early, before most people, and I still take time to hit the gym and do those things. So yes, it’s on. What we tell our employees is, when you’re home, you’re home. Try to stay home. We have on-call people. We pay them to do on-call. They’ll take care of the stuff after hours and all weekends. Don’t worry about it. When you’re not on call, please be with your family. Don’t be checking your emails. You have to find a way to do that. We all do. From the management ranks, you’re checking your email all the time. No matter what you tell people, they’re doing it anyway, because they don’t want to come back to 300 or 3,000 emails after a long vacation. We’re all turned on, it’s just having that conversation. We have that conversation constantly. When I see employees here, I walk around and I talk to them. I don’t talk to them about how their job’s going. I talk to them about what’s happening in their life outside of here, which reinforces the fact that it’s important to me to know what’s going on with them and to know that they have a life outside of here, and that it is important. Honestly, I have an open door policy if anyone wants to talk to me about work. But when I’m out talking to the employees, when I’m at any of our facilities and I see any of our staff, I’m asking them about how their life is and what’s going on in their lives and what’s important outside of work. I’m not asking them about the job. Gamble: Right. Now you’ve been there since 2008. That’s a really interesting chunk of time just as far as everything that’s happened in the industry. Where do you see the organization continuing to evolve? Pacek: This is the most interesting time in my 35 years in healthcare IT. It is absolutely very dynamic. We don’t even know what the future holds for us; we just know it’s going to be different than it is today. It’s changing that rapidly. It’s exciting times. This is a great organization. Reimbursement is getting cut. We do a tremendous job of reducing cost to the organization. I don’t know how we do it all the time, but people find ways to make the cuts necessary to keep a healthy bottom line. That healthy bottom line helps us continue to move forward with technology, to continue to get the capital funding that we need to make things better, improve patient care, improve safety, improve the work flow, and help people do their jobs better and more effectively. So long as they’re doing that, I’m a happy camper and we’re continuing to move forward, and I don’t see that changing here. We have a very aggressive executive team here that don’t mind taking risks. It’s not so risky — I wouldn’t say we were bleeding edge people by any means, but we like to be on the cutting edge of things as much as possible. As long as we stay aggressive and we stay mindful of our expenses and do a good job there, I see this organization just continuing to move forward at a rapid pace. Our physicians have been onboard with us for a while, and they’re continuing to show their support by joining the PHO, doing ACO activities with us, and really engaging. I’ve seen the physicians engage in ways I never, never thought would happen in my 35 years. It’s taken a long time to get there, but they’re truly engaged with us, and wanting to know and wanting to be a part of the decision-making process. It’s less about pushback and more about really giving some good feedback and saying, ‘this won’t work for us. We like the idea, but can we do it this way?’ It’s great dialogue to have with the physicians. They’re the ones providing the frontend patient care; we want to make sure that they’re doing it as efficiently as possible so they can see as many patients as they need to and make sure they’re doing the right things for the patient and not missing anything, and also not doing things that aren’t necessary to provide care to the patient. Gamble: Yes, it’s interesting how that is starting to evolve. It’s getting closer to more of a partnership, and that wasn’t really the case 5 or 10 years ago. Pacek: You’re right. We have an IT committee for our own physician practices. We have an IT committee for our physician hospital organization. We have an IT committee for each hospital, because they’re still two medical staffs; even though we’re one Inspira Health Network, we have two medical staffs. So we actually have a joint meeting between the two medical staffs, and then we have individual breakout IT committees for local issues related to the computer systems or with their practices. So yes, there’s a lot going on, and IT is right in the middle of all that. Gamble: The last thing I wanted to ask you about was getting out there in the industry. 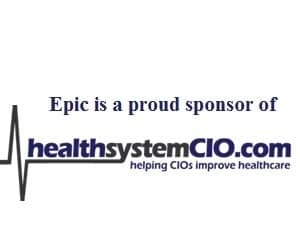 I know you’ve been involved with Delaware Valley HIMSS and there are things you do with HIMSS and CHIME, and I just wanted to touch on how that benefits you and why you think it’s important for CIOs to make that time to get involved with these organizations. Pacek: I’ve always gotten a lot of benefit out of the local HIMSS group and the national HIMSS group as well. The local HIMSS group I’ve been involved right up to being president of the Delaware Valley chapter and have been on the board for many years there. I stepped down probably two to three years ago. I took myself out of consideration for the board just because we had this merger going on. I didn’t feel like I could do my responsibilities to the board appropriately, so I felt like it was better to take a step back and continue to be an active member of the membership. But you learn. I grew up with Delaware Valley HIMSS. That was my first exposure to doing large group presentations and sharing knowledge with other people. I have some very close friends at competing hospitals. We compete with them, and we’re really close. We share common problems and solutions to those problems. It’s interesting because IT people are a little bit different than the rest of the executive team in that we like to be collaborative with our competitors. We don’t necessarily see it as a competition as much as others executives do, because we share common problems and we’re all trying to help each other out. It’s a very tight-knit community. Healthcare IT is a very small industry; friends and faces pop up in different companies. You get that experience and you start to build those relationships in the Delaware Valley HIMSS or New Jersey HIMSS groups, the local HIMSS groups. It’s harder to do that in the national level, but it’s definitely easy to do at a regional level. The content for education is phenomenal at the regional meetings. These people really give their time and energy. There’s great value in there for the memberships, so you learn leadership skills too, working with people. You learn from each other. I just find it invaluable. It has really helped personally my career. I mean, you and I are talking today. The word Inspira is out there. We’re sharing some of the stuff we’re doing, and I love to do that. Our CEO loves to know that Inspira’s out there sharing information and being thought of as a thought leader in the industry. It’s positive press word for Inspira, and he likes that and encourages it. I try to encourage all my team to be as involved in the associations as possible. Take leadership roles. Don’t be afraid to volunteer for committees. That’s how you get your name out there; that’s how you become a better leader. And I just think it’s great. I think it’s a great opportunity, and I’m looking forward to jumping back in now that we’re beyond the merger. We’re doing some new and exciting things — I’m still busy, but I’d like to get back to the board role at either the New Jersey or the Delaware Valley chapter. I belong to both and try to stay active with each. Gamble: I’m sure you’re still busy. I don’t think there’s any doubt there. Pacek: Again, it’s exciting times, and it’s time to share it with people. I use National HIMSS to learn what’s happening on a global level, what are the latest hottest products coming out, and who’s got what from a vendor perspective. But I also find myself doing a lot of networking and it’s the same people you’re talking to. You’re talking to your regional people, you’re talking to your Cerner compadres at other facilities — learning from them and what they’ve done. That’s great, it’s invaluable. You have to do that. I like to have a partnership with my vendor, whether it be Siemens, Cerner, or whoever. You learn the most from other people using the same products. You learn a lot from them — what their experience has been, good, bad, or indifferent. So I encourage everyone to try to get involved in their local HIMSS organization. Gamble: That’s great. And honestly, just by taking the time to speak with us today, it’s so valuable because other people are all going through similar experiences and to hear, ‘okay this is how they’re dealing with it,’ that’s what’s so valuable and I really appreciate you taking some time to speak with us and tell us your story. Pacek: Absolutely, and if anyone has any further questions on any of these topics that we talked about today, I’d be happy to speak with them. My contact information is public information, so if anybody needs it or wants it, you’re welcome to give it out. Like I said, I love to share and I love to learn from others as well. Gamble: Alright, great. Well, thanks a lot, and I’d definitely like to check back with you down the road and see how things are going. Things change so fast that there’s never a shortage of things to talk about. Gamble: Thank you, and I hope to talk to you again soon. Pacek: Thank you very much, and have a great afternoon.